« “Expert Cube Development” Second Edition Available Soon! Anyway keep up the good and fine works from yours. It did occur to me that this would make a good podcast… but I’m on the road this week, and I don’t have my headset with me unfortunately. This is a neat example, and does show some of Power Query’s capabilities, and it is always great to see Power Query postings. But I wonder if this is not a case of ‘old-school corporate BI types’ over-engineering it :-). You say that it’s more long-winded but not more complex. I have to disagree, I found it quite a bit more complex, and as I followed your post I had a few issues. When I inserted the column for the Allocated Amount and then renamed the column, a two-step process, this gave me errors in later steps. I found that I had to I had to delete the RenameColumn statement, and then change the column name (which was of course Custom) in the InsertColumn command in the formula bar. When I was adding the custom column to get the Month data, it inserted an extra AddColumn statement, ‘each Table.AddColumn(InsertedCustom, “Custom”,’. 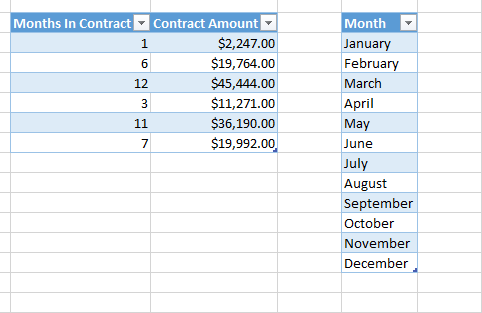 When I tried to expand the column, I could see the Contract columns not the Month columns. Removing that extra statement and the final closing brackets solved the problem, but it took a moment for me to figure out what was going on. In addition, I couldn’t see why you added an index to both tables, so I tried it without (I guess that maybe you always add an index column as a best practices approach). Everything worked fine, except of course I couldn’t sort by month name in PowerPivot, but I can do that in the pivot table just as easily. To me, the standard Excel solution of determining the allocations that Bill shows is far simpler and far more intuitive, more likely to be understood by a self-service BI consumer. Obviously the issue is that you then have a cross-tab report that is not conducive to further analysis, but that is easily resolved. 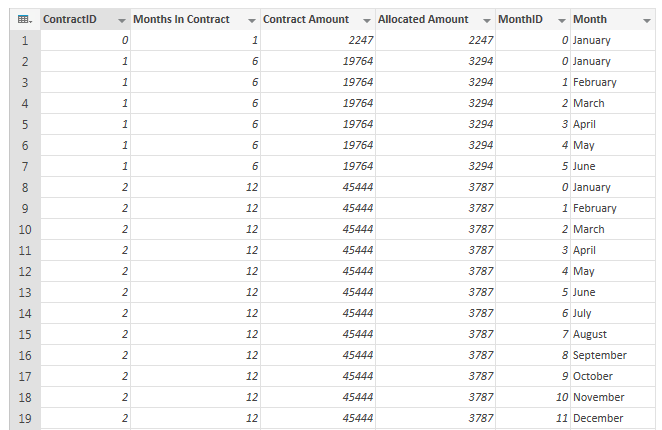 Take that extended Contracts table into Power Query, unpivot the allocation columns, filter out the blank rows, and you can then load that into your datamodel and do all the good things with it. 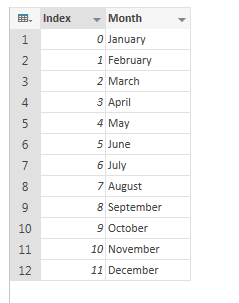 To me that is very simple, no extra month names table, very straight-forward, something a good Excel pro could easily follow. I guess which approach you prefer depends on how good your Excel skills are to begin with! You’re right, though, most real users already have better Excel skills than PQ skills. I’m not sure why you had problems renaming columns though – PQ is usually very good at handling this kind of change – or why you got an extra AddColumn statement (did you click the button twice?). I added index columns because I like primary keys on tables: in this case it made no difference, but if two contracts had the same amounts then that would make later reporting more difficult. I am not sure about that renaming, I don’t recall having a problem before, but then I didn’t use the renamed columns like this before. On the indexes, once I had realised that the index columns were not necessary, I guessed that was why you did it. I thought it was useful to point it out for anyone who was trying to follow what you did rather than just do it by rote. On the other problem, yes that was exactly what I did initially. I figured it out, but that is part of what I mean by complexity. I am not at your level on M and I would guess that few people are (perhaps we all will be when we get your book :-)), and so when the problem manifested itself, it is far from obvious what happened and how to resolve it. I’ve edited the post to make the part about the custom column clearer. Using Table.FirstN for this is a brilliant idea. To stick to the original approach, one can use Table.Pivot (not in the UI, I’m afraid). BTW, indexing the tables is not necessary. Thanks Frank. 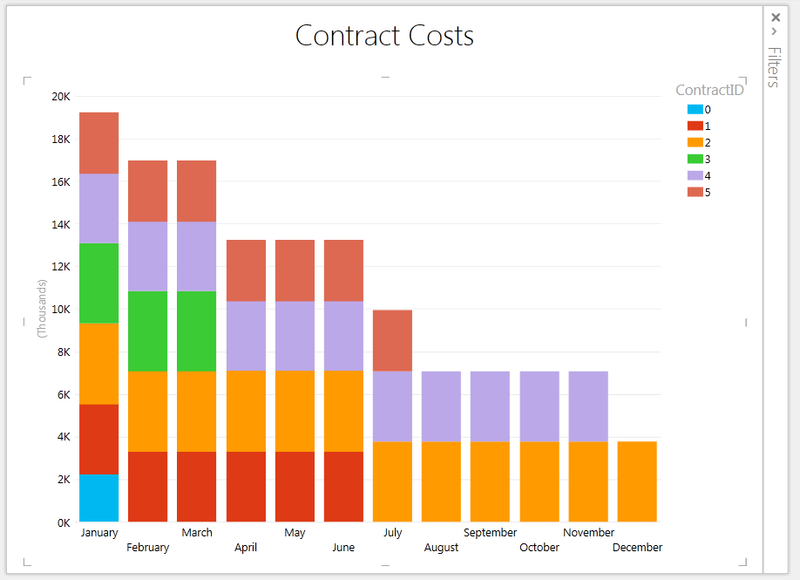 I know the indexing isn’t strictly necessary, but for the months it allows me to use Sort By Column so I don’t need to do sorting in the PivotTable (and it’s the only way to get months sorted properly in Power View); for the contracts it means I have a primary key on the table so if there are two contacts with the same amount and number of months they won’t get aggregated by accident in the output. I stumbled across the above article which I found very helpful. I am currently experimenting with assigning annual budgets across a financial year. Your example would provide most of the solution but, the only thing I think would add real value would being able to extend the date functionality. So, if there’s 12 months and the start date is ’01/01/2015′ the following 12 month’s dates would be incremented by one month – therefore the twelfth entry would have a date of ’01/12/2015′ – do you think this would be a reasonably simple addition? Finally, I may call upon your services in the future as I pick up work that I can’t do on my own due to work demands and / or I don’t have the technical experience. It should be possible, yes, but I would need to think about it. I’m on holiday right now though with no access to Power Query so I can’t test anything. Thanks for getting back to me – have a great holiday.